Brumhaus was approached by Wealth Solutions UK Ltd who are based on Frederick Road in Edgbaston, to create an artwork reflecting the beauty of the local area, and they were extremely happy with the result. It now takes pride of place in their boardroom. The commissioned canvas print was size 2m x 1.4m. As you can see from the visual many of the places depicted are recognisable, from the cricket ground, Oratory, Botanical Gardens, QE Hospital all the way to Birmingham University. It also shows a portion of Bournville and the Cadbury’s factory in the distance. “I am a product of Brum myself, having been born in Edgbaston and lived a large part of my life in the area so this was of special interest to me. The client had a wishlist of places they wanted to include and I visited Edgbaston Golf Club to take in their fantastic views of the area. 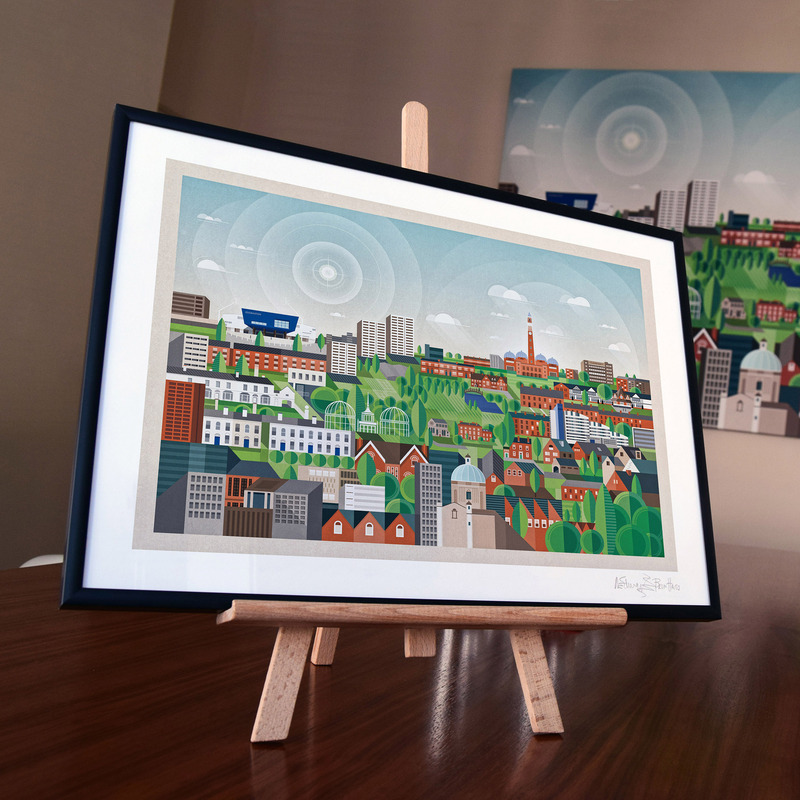 The result is a menagerie of local places of interest and key buildings, from the city side to the great, green spaces and all the way to the distinctive suburban houses.” Artist, Alexander Edwards (BRUMHAUS). A version of it can be purchased as a gallery quality print in the usual standard sizes (40 x 30cm, 50 x 40cm, 60 x 45cm, 80 x 60cm) and by request at A0 size. Click below to buy from online reseller Redbubble.